Author’s note: If this process doesn’t work for you, that’s okay. You’re on your own journey; I get it. Consider this an insight into the thoughts of one of the locals along the way—an ex-mechanic who once had a beard and today can grow nothing else. If I’m boldly assertive here, be glad I’m not bitter. For purposes of stage direction, you are exactly like me. You have tools and a wall you can drive screws into. You like to work on bicycle(s), but darn it, sometimes you’ve got to fix something in a hurry so you can get back on the road. You hate wasting time, but you’re not the most organized person in the world so you’re a fan of anything that makes it easier to keep track of tools. In addition, you 1) wear glasses to find your glasses, 2) are listening to a mix of songs off the latest albums from Rosanne Cash and Sharon Jones and the Dap-Kings, 3) don’t watch or appreciate millionaires playing American football, and 4) love apple pie but will deal with pumpkin if that’s the only alternative. In short, you are fabulous. And you’re just about ready to create two things: A) a tool board that some of your tools will hang from, and B) a tool holder that other tools will sit in. 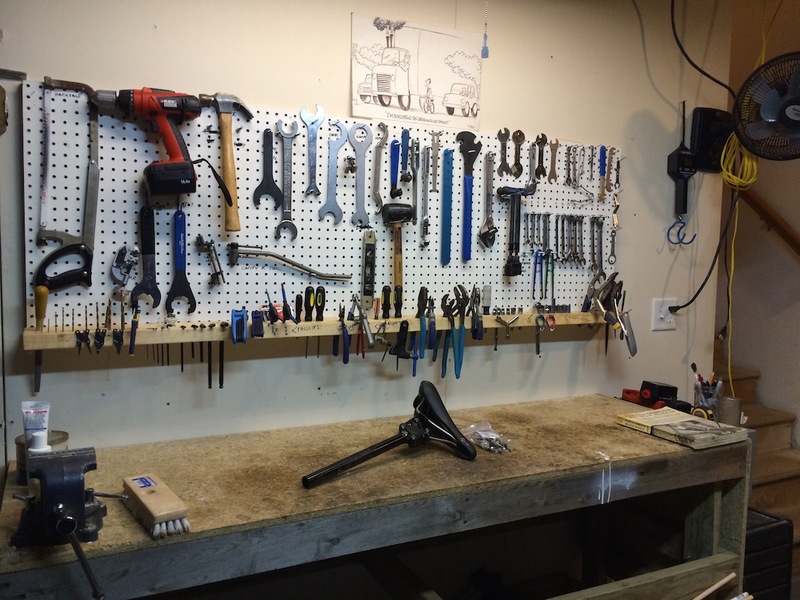 Here, then, are the 15 steps to tool storage enlightenment. 1) Gather your materials. There are two ways to build a tool board: with pegboard or plywood. If you use pegboard, make sure have what you need to build the frame that will space it away from the wall. You’ll also need hooks or bolts for hanging tools. (I also use nails through the frame of the pegboard.) Got plywood? Get nails. In either case, you’ll eventually attach your tool board to a wall. Use a stud finder so you can securely attach your tool board to a stud wall or break out the masonry bit and bolts if you’re working with concrete. A good drill with a variety of bits will make your project go a lot easier. Get two or three spade bits up to about an inch in size–you’ll need them to make the tool holder. Contrast between tools and background really helps, so if you’re dealing with a dark plywood, paint it white before you start driving nails into it. Regardless of your project’s design, be sure to wear safety glasses when you’re working in the shop. Nothing slows down your work like a quick trip to the emergency room. Also, there’s no such thing as a quick trip to the emergency room. 2) Focus on bicycle-related tools. The next steps are all about reducing and rationalizing the number of tools you need to display. First, store your drain snake, pipe wrenches, drywall circle cutter and bee smoker somewhere else. All you want for this exercise are the general and specialized tools of bicycle repair. 3) Identify your most frequently used tools. Have a headset press you haven’t used in five years? Store it in a nearby drawer or a tool box–if you need it you’ll find it soon enough. Got a pristine 50th anniversary Campy tool kit? Keep it in the case next to your wine cave. You want to identify your most-used tools so you can make them highly visible and easy to retrieve. Think spoke wrenches, Allen wrenches, a chain breaker–that sort of thing. Cone wrenches, if you need them (if not, you lucky Phil Wood hub owner you, store them in the aforementioned drawer or tool box). 4) Divide your collection into tools that hang and tools that don’t. Wrenches and mallets go on the tool board. 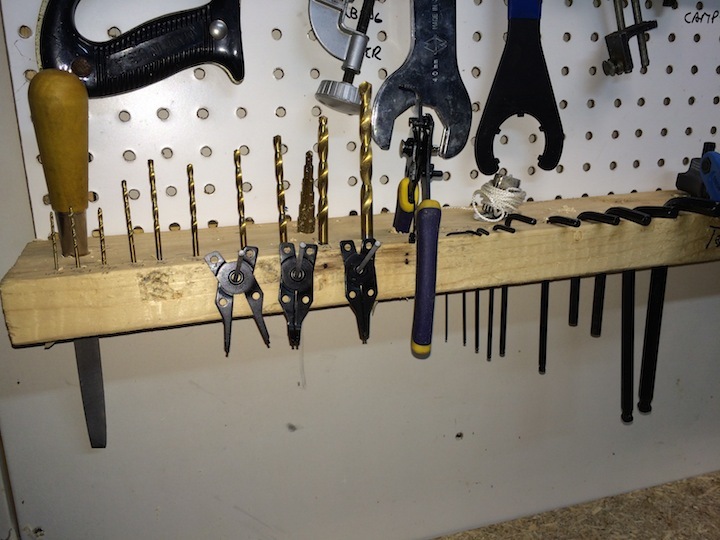 Tools that don’t hang, like drill bits, punches and Allen wrenches, are stored on the tool holder you will attach to the base of the tool board. 5) Determine your tool-reach comfort zone. If your tool board will be above and behind your bench, make sure everything is within reach, not too high, when you’re in front of the bench. At the same time, you’ll want to keep the top of your bench clean–if tools stored in the tool holder keep you from brushing dirt off the bench, they’re hanging too low. If you have a full-sized sheet of pegboard, you’ll be close to the right size if you cut it in half, lengthwise. If you’re right-handed, your tools should be arranged right to left in order of frequency of use. If you’re left-handed, left to right. Some tools–hacksaw, freewheel removers, chain whips–should be stored closer to your bench vise. Others–spoke wrenches, tension gauge, dishing tool–closer to your truing stand. Right now, I bolt my truing stand into my bench vise; eventually, I’ll create a separate wheel-building station. 7) Think one-dimensionally. When you look at the tool board/tool holder, you will only see the tools that aren’t obscured. So don’t stack or double up your tools. The hook for the 6-inch adjustable wrench is for that wrench only, not for the adjustable, a headset wrench and a bottom bracket spanner. That said, there are some items you might be able to double up: two 13/14 cone wrenches for example. Both wrenches are the same, and you’re likely to use them at the same time, so the only downside to doubling up is thinking both of them are on the board when only one is. 8) Make the tool holder. There are all kinds of tool holders for pliers and screwdrivers and such that you can attach to your tool board. Don’t buy them. Make one–a big one. I love my cordless drill. With standard drill bits and two or three larger spade bits–and plenty of juice in the batteries–I can easily drill holes in a 2×4 to hold everything from individual Allen wrenches to files to locking pliers to, well, drill bits. Position a horizontal 2×4 in your bench vise and install tools as you drill to make sure the spacing is right and the tools are easy to remove. Want to make it easier to pull bulky tools out of the tool holder? Drill holes at an angle. Drill only the holes you need, and label all the holes you make so you know which tool goes where. In the next step, you’ll bolt the tool holder to the base of your tool board. 9) Design the tool board. I’ve always used pegboard and stored my tools on a mix of pegboard hooks and bolts running through the pegboard holes. However, the next time I redo my board, I’m going with plywood and nails, as Jim Langley* recommends. For one thing, it’s easier to drive additional nails to accommodate new tools than remove a pegboard so you can rearrange bolts. For another, you don’t have to build a frame to space plywood away from the wall like you do with pegboard. Set the tool board flat on your bench. Bolt the tool holder to the base of the board, being sure to attach it through the frame if using pegboard. Loosely lay the remaining tools on the board. Be mindful of the relationship between lower tools (in the holder) and upper tools (on the board). Make sure upper and lower tools won’t rest on each other when stored and that they are sufficiently far enough apart that you can remove and return them easily. Continue placing tools on the board. Space them so they don’t overlap. Overlapping tools are tools you can’t find and tools you’ll knock off the board when you’re in a hurry. Some of your tools may naturally hang at an angle. To test, hang tools from a hand-held nail and then adjust the space you’ve reserved for it on the board. 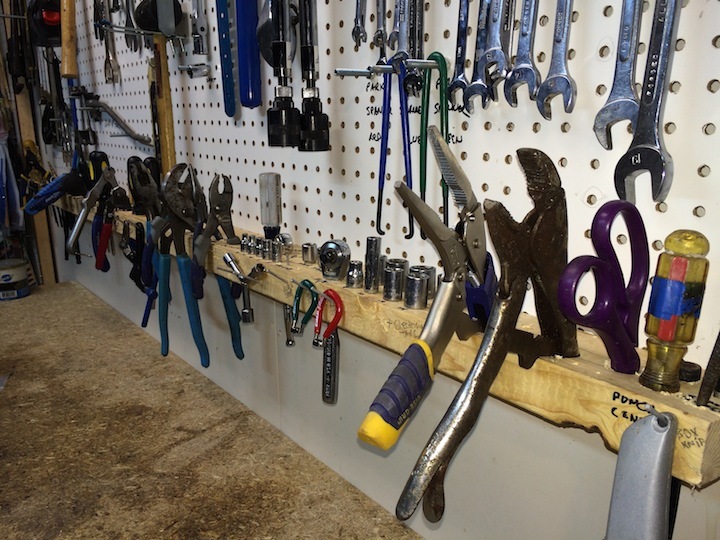 Once you’re happy with the position of your tools, attach the required hooks and bolts to the pegboard, nails to the pegboard frame or nails by themselves to the plywood. Using a pencil, label the board with each tool’s position. 10) Quick thought: You can future-proof your tool board. 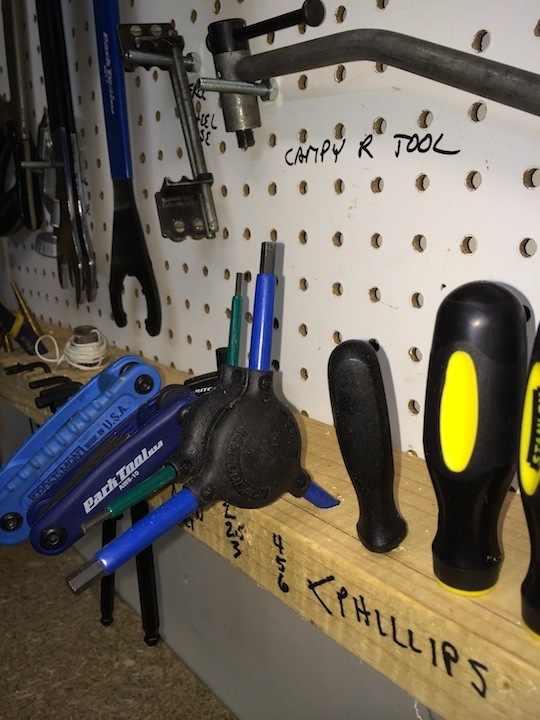 If you can, leave a portion of your tool display empty so you can add tools in the future. 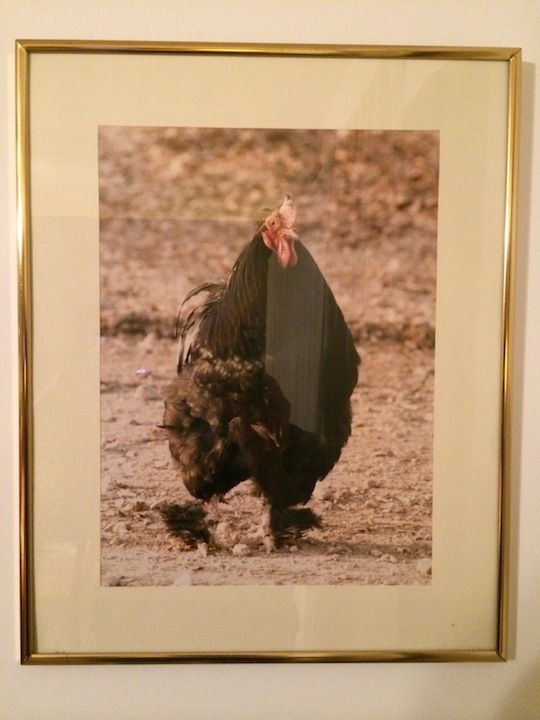 If the blank space bothers you, hang a picture of a rooster. 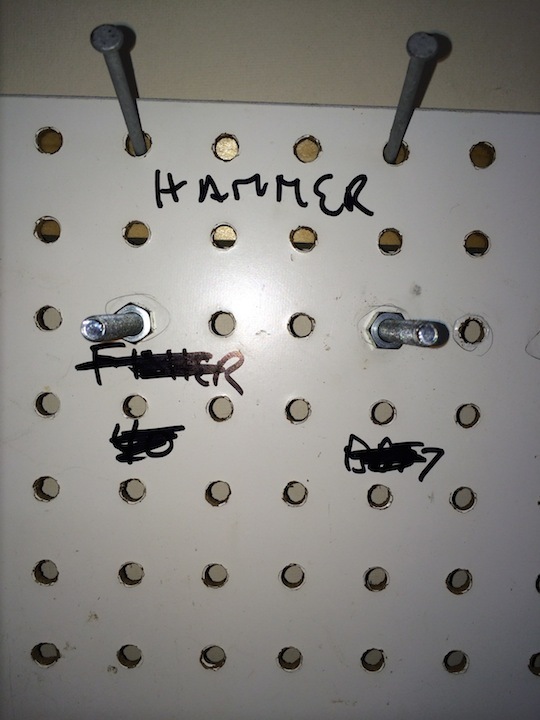 11) Label the tool holder and tool board under each tool. While the board is still flat on a horizontal surface, remove the tools one at a time to label each position. Why label the board if it’s going to be full of tools? Because you’ll never misplace a tool–there’s only one place for it to be. Plus, if a tool is out of place, you’ll know immediately because the board will tell you. 12) Secure the tool board (with pre-attached tool holder) to the wall. Once you hang the tools, you may still have to make a change or two. Just erase and relabel with the pencil. When you’re confident the board is correct, trace the penciled labels with a black felt-tip marker. 13) Return tools after every repair session. Sometimes I travel so I can work on a friend’s bicycle. So I put everything I think I’ll need in a toolbox and head out. When I return, I can pull tools out of the box in any order, knowing there’s only one place that each one can go. 14) Give new tools a home—before you use them. 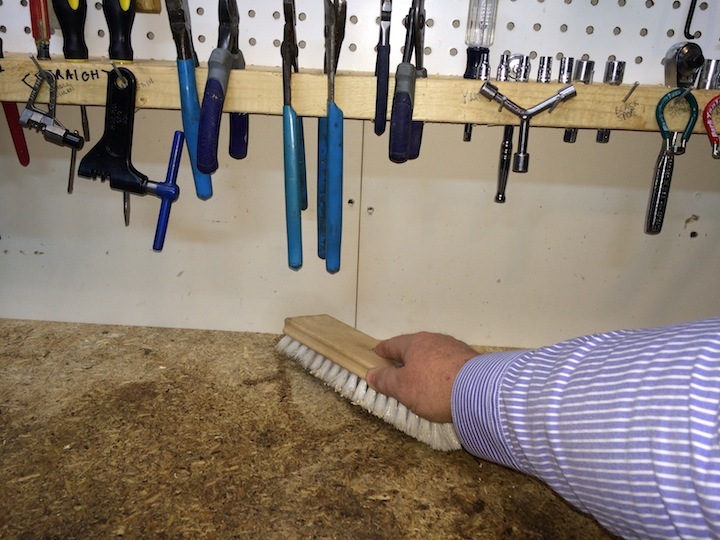 Drill a hole in your tool holder or add a pegboard hook, bolt or nail to the tool board. (If nailing, be sure to remove any tools you’d rather not have drop to the bench or the floor.) Label the new tool’s position. Congratulations, instead of just buying another tool to misplace or damage, you’ve expanded your repair capability in a systematic and sustainable manner. Laudable accomplishment, that. 15) Don’t return broken tools to the board. Instead, leave the tool’s position open. Then, before you ride to the hardware store or bicycle shop, make a list of tools you need to replace based on the visible labels of broken and otherwise missing tools. Right now, for example, I’m missing a 6mm ball-end Allen wrench and a ⅜ to ¼ socket wrench adapter. Sad thing is, I know they’re around here, somewhere. 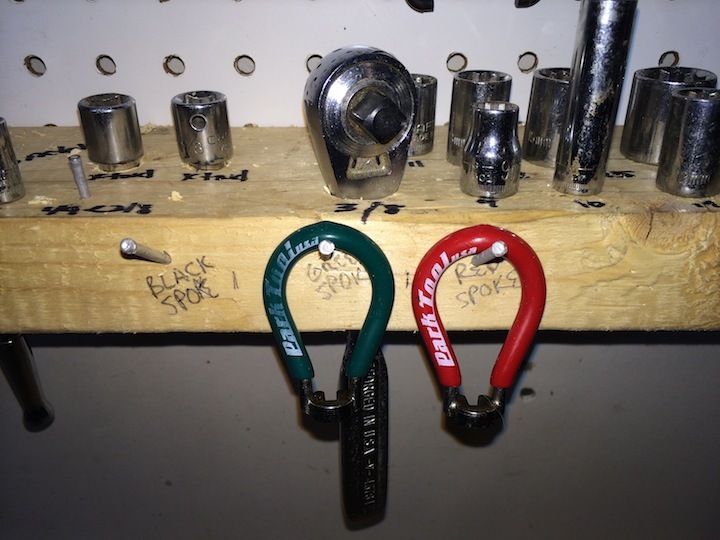 This entry was posted in Equipment and tagged bicycle mechanic, bicycle tools, organization, pegboard, tool board, tool holder, Tool storage. Bookmark the permalink. So, Mr. Fabulous – and thanks so much for putting it in italics – another fine mess you’ve gotten me into. Now I have to go downstairs and get some wall space! Egads, MAN! I need a solution to the planar dilemma – and some warm weather to avoid loosing digits while pulling all the bits and pieces out of the garage to expose a wall. But, then – I knew the job was dangerous when I took it. you , hung up the cordless drill ! Yeah, it’s not the most successful addition to the board. Someday I’ll rework the holder so the drill presents handle-first. 16. Take a picture of your tool board, post it on Facebook, and ask Langley and other more-experienced buddies: What tools did I forget? If you didn’t follow rule #10, you’ll be sorry. If you did, the rooster will be sorry. No comment on how this right-handed person seems to have put locking pliers on the most-frequently-used side of the board? Thanks a lot for the great column today and for plugging my blog and book. I appreciate it a lot, Sam! I’ll spread the word about your column. It’s a great one. Nice toolboard! Thank you for the note. I’m getting ready to rebuild the bench–and put together a second for wheelbuilding. Wish I’d had your book before the current toolboard–would have done plywood for sure.